I’m psyched about this week! 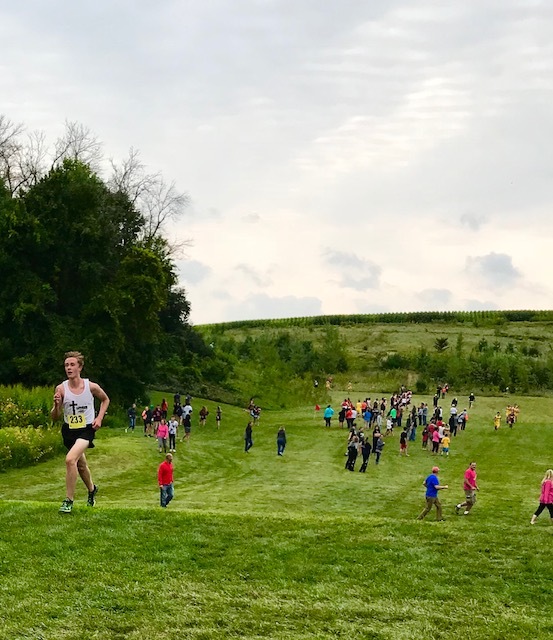 With scrimmages and races kicking off, would love to hear reports/observations on scrimmages and races happening to get the fall CC spirit going. The Cloverbelt conference has a pretty cool annual scrimmage (4k) at Levis Mound in Neillsville tomorrow (Tues.). Mixed conference teams and teammates, with a potluck afterwards to get to know some runners from other teams at season start. Not expecting any exceptional performances or contenders from this conference - but you never know, what makes each CC season so compelling. What’s happening in your neck of the woods? Let the meets and discussion begin! Luther’s Sam Larson with a 75m lead 2000m into the 4K race at Westby. Observations - Nothing really stands out here, but what could be better than watching a CC meet in almost perfect conditions (68 deg.) on a in-the-middle-of-nowhere backwoods bike/ski trail with a potluck dinner after for the runners. Altoona boys have a lot of young runners that could develop into future success. Boys winner Jacob Seidel Owen- Withee, 45 seconds behind 2015 winner. Fastest girl Savanah Schley, Loyal-Greenwood (24th WI D3 State Meet) a repeat winner but slower time than last years meet (yet over 1 min. faster than 2nd place), and Altoona D2 girls could be competitive with a 5th runner. Course is 2.67 miles (about 4.3k) from what I’m told, so factor that in the times. I suspect that the meet today at Lake Geneva Badger will be the first for the teams listed below. I think that Mukwonago could have a solid season - they are not deep - so they will have to keep their top 5 healthy. Ian Nadolski has improved every year - will be interesting to see if he has yet another gear. Mukwonago adds a senior that has has previously played football - and I’m told he is a top 5 type guy. The Milwaukee River Invite, which you could also refer to as the “Sectional 7 Preview” took place today. It looks like Whitefish Bay is the clear #1 there, but there are then 4 teams within 30 points of each other (if you subtract ~100 points from Homestead’s score once Bosley gets back in) today fighting for 2nd, plus Tosa East who started slow last year but came on strong late, and Germantown who looked strong at the front at Rotary Park today but needs to find a 4 and 5. This isn’t the strongest sectional in the state as far as firepower but might have the most teams with a legitimate shot at qualifying for state out of any sectional, so it should be interesting. 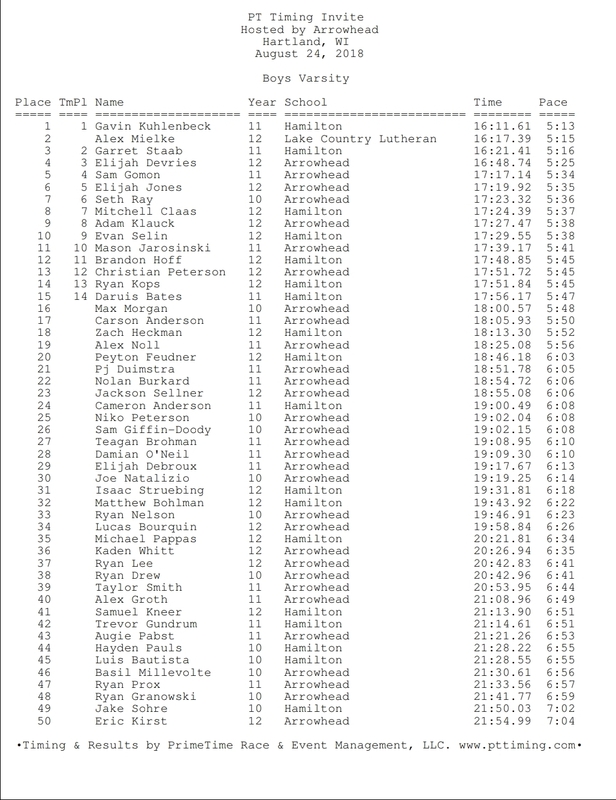 Nadolski dominated on the boys side (16:30). Beautiful day for sure but still a bit warm for some of the runners. Saw all of these guys walking around with vests, sunglasses, and hearing devices - then realized it was secret service - Paul Ryan was at the meet watching his kid run. Durand boys team is in need a 5th runner, but is looking reloaded and good again. nothing too special on the girls side, except Durand again looking for a 5th! Just a little note, when I posted the results everything was a minute faster than it is now (i.e. Dyer was at 16:20 and so on). So if the ones up now are the real results then yes, Germantown is obviously the best in that sectional and it is indeed a weird opener for Dyer. That hale kid in the falls frosh soph should be considered dangerous and those 18:00 germantown kids are probably 17:00 kids. That frosh soph race always runs slow. 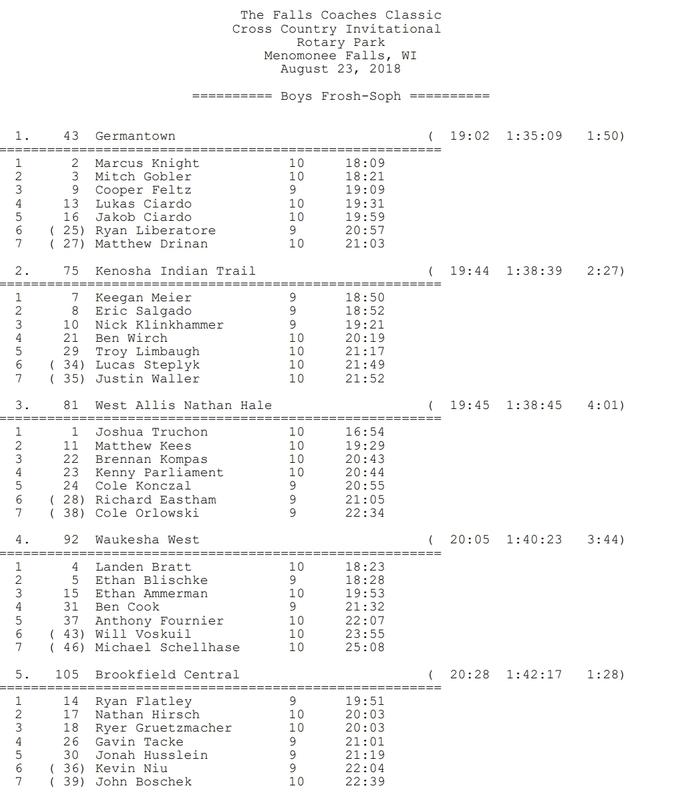 Germantown put three under 17 in the varsity race. That is a good team. Once streched a bit thinner you have to wonder how good of a #2 Drinan can be – 1:57 in the spring, 16:29 last fall and off to a near PR start. Devries didnt not try here (double negative) and finished behind Kuhlenbeck as well as Mielke. 26-30 Arrowhead over Hamilton. Girls winner Isabel Seay of Hamilton in 15:06.73 (4k) with a 57-second margin of victory. Jamie Block times are way slow compared to last year. 60 to 75 seconds. Course change? Mud? Germantown’s sophomores are decent but what stands out to me is the freshman kid’s performance. Probably his first ever race in HS uniform. This means young Indian Trail is on the horizon and the potential enrollment beast is awakening. If we were to put the current West Allis Hale coach at Indian Trail for the 2019-2020 school year would the outcome be a reincarnation of Racine Case 69 to 95?